Bruno - pit/ boxer mix. Bruno was owner-surrendered at 8 years old. 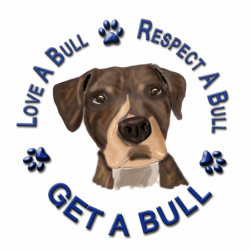 This sensitive soul was the inspiration for the Get A Bull logo. He loves all people and is great with dogs and cats. After being fostered for over a year under another rescue, Bruno was ADOPTED by a Get A Bull co-founder (foster failure) shortly after becoming the first Get A Bull dog. Now 10 years old, Bruno is a great host for all foster dogs and cats that his parents bring home. Gilly - pit bull mix. 2 year old Gilly landed as a young stray at a large municipal shelter. He was terribly frightened there, known for shaking in his cage, but he also was known to be very sweet and loving with people. After about 2 months in the shelter he became a Get A Bull dog and spent a couple of months in a foster home learning house rules and doing basic obedience work. Soon after, Gilly landed an amazing forever home where he is loved and adored! Tina Fey - pit bull mix. 5 year old Tina has not had an easy life which is why we are so happy she is living the good life now! Tina was a stray who was hit by a car and came into a shelter with a severely mangled paw and showing evidence she was a throw away mom. She got her paw all fixed up and then spent 5 long months at the shelter waiting for a home. Initially shy, Tina Fey warmed up to people and became a super star at off-site adoption events and was very loving with other dogs. She joined Get A Bull as a foster and quickly became a foster failure and now lives with her family and 3 cat sisters! Calvin Klein - Staffordshire Bull Terrier Mix. After Calvin, his "wife" and their kids were found abandoned in a house, living in their own filth, the dogs were all rescued and brought to a local municipal shelter. There Calvin was vey afraid and he would growl at people from his kennel but it was discovered that outside of his kennel he was very friendly with people and also that he was awesome with other dogs. After a few months in a cage, we rescued Calvin and he became a foster dog. He lived in a house with many other dogs and even the occasional foster kitten for several months before he was adopted to a loving family with another lovable pit bull named Betty White! Charming - Pit Bull Mix. Charming arrived as a 10 month old stray to a local municipal shelter and 10 months later he was still there. Charming struggled more than other dogs at the shelter and would jump up and down all day in his kennel banging his head, biting his tongue and he was also difficult to walk . . . he was just very anxious and had so much energy. The good news for Charming is that he loved all people, dogs and even cats and he was very smart and eager to learn. He learned and thrived in his foster home and although it took several months for him to be adopted, he hit the jackpot with a loving and dedicated Mom and Dad. Unfortunately almost THREE YEARS later Charming was returned to us after his family divorced but he found a great new family!! We love this boy. Mindy - CAT! One day we got a call from a teenaged boy urgently looking for help with an injured cat in his backyard. He had been caring for her for several months after she showed up as a stray and that day she came home beat up and bloody. Despite being a pit bull rescue, we took Mindy into our care, vetted her and discovered she had been hit by a car and had a paralyzed front leg. We also discovered she was a very sweet girl. Mindy was spayed and vetted and over several months in foster care she adapted to her disability. Then one day the most perfect cat mom saw her story online and came to adopt her! Mindy is so blessed and is a spoiled only pet! Bubbles (FKA Alexia) - Bulldog/Pit Mix - Bubbles and her 3 housemates/siblings were breeding dogs who escaped from their home and were found as a group of strays. Their owner was located but when they were informed of the shelter's mandatory spay/neuter policy to redeem their dogs, they said no thanks. We were so excited to bring Bubbles into our rescue as a foster dog and soon after she found an amazing home in the country with a cat sister and a Dad who is crazy about her. Bubbles is living the good life! Tripper (fka Presley) - Pit Bull Mix - Tripper was originally found by neighbors chained up to a tree in a backyard and brought to a local municipal shelter. Just a young guy of 1 year old, he was very scared at the shelter, his whole world turned upside down. A volunteer alerted us to this active, dog loving, cat loving guy after he'd been there a couple of months and we were able to bring him into our foster program. What an amazingly sweet, silly and loving dog he is!! Presley learned manners in his foster home and was adopted to a dream dog Mom who is also a vet tech. He now goes to work with her every day and spends his days in the attached doggie day care, playing and doing agility which he loves and then comes home to his 3 cat siblings! Gertie - Bulldog/Pit Bull Mix - Gertie was surrendered to us from her owner. She adopted Gertie as a puppy but Gertie didn't get along with her boyfriend's dog and ultimately after a fight, Gertie found herself in boarding. We assumed responsibility for Gertie and started looking for a home. We found a really outstanding adopter who loved Gertie's cute little face and also was willing to work with Gertie's reactivity to other dogs on the street. We sent Gertie to a board and train for a couple of weeks and then she transitioned into her new Mom's care. Gertie is doing great and is very loved in her forever home. She still is working on her reactivity issues but luckily Gertie's forever Mom is one who is willing to stay the course and is devoted to her dog for life. Louie (fka Lucky) - Pit Bull Mix - Louie was rescued from a high kill shelter in Louisiana that does not do any public adoptions. He was just a baby of 6 months and we couldn't bear to see him lose his life. We partnered with a rescue called Animal Aid for Vermillion Area who helped us find a local foster in LA where Louie spent some time being vetted (he was treated for mange), neutered and preparing for transport up north via another great organization, Kindred Hearts Transport Connection. We had a great foster home lined up for Louie here in New York. His parents and foster sister Bessie fell in love with him and after a few weeks they became "foster failures." Sometimes it is just meant to be!! Ferragamo aka Ferg - Pit Bull Mix - Ferg is a gem of a dog who landed himself at a large municipal shelter where he was beloved by staff and volunteers but still couldn't find a home. Even for the sweetest dog, standing out among a sea of 100 pit bulls can be really challenging. Meanwhile he was extremely thin and sick with swollen glands and he just couldn't get better because of stress. We welcomed him into a foster and not too long after he found himself an amazing home with a Mom & Dad, a human brother and sister and a doggie pit bull brother who had also been rescued from a municipal shelter just like Ferg.. They adore this boy!! Darla - Pit Bull./Rotti Mix - Darla came to us as a 3 month old puppy from a municipal shelter. Her siblings went to different rescues and we had the foster space to take in a puppy! We thought she would "go fast" but she was in our care for a few months, despite getting along well with cats and dogs and being a very sweet puppy!! Darla was actually adopted and returned back to us when her adoptive family was just overwhelmed by the work needed to raise a puppy. But that turned out to be a huge blessing when we found Darla's true forever family, a big family, with other dogs to play with, and tons of people to dote on her! And the rest is history, Darla is almost all grown up now and very loved. Mack - lab/pit mix - When someone we knew was looking for a black lab mix puppy and we saw Mack on Facebook in a high kill shelter in Louisiana . . . everything just came together from there. They saw his picture and said YES we want him! He went to a foster home in LA via Animal Aid for Vermillion Area until he was neutered and ready for transport and he was transported by a really amazing organization called Rescue Road Trips! His new mom could barely contain herself until he arrived and since then it's been a real love fest between Mack and his parents. To say he is adored is an understatement!!! Mewissa - CAT! - Mewissa was a very sick kitten who came into our local municipal shelter fighting for her life. She was fostered and loved by a shelter staff person and after months when she was finally healthier (but still fighting a URI) she wanted her to get adopted but did not want her exposed to anything at the shelter at which time we decided to take her into our foster program and make her a Get A Bull cat. Mewissa ended up being fostered by one of our founders and she foster failed!! Mewissa LOVES dogs and now has 2 dog sisters, a cat sister and a rotating bunch of foster dogs in her life!! Mewissa sadly was always a very sickly cat with many medical issues and she sadly passed away at 2 years old and is very missed. Ziggy (fka Luke) - CAT! - Ziggy and his brother were found as the teeniest tiniest kittens by a woman in Brooklyn who saw a bunch of little kids throwing them in the garbage! She intervened, got the tiny kittens, and ended up contacting us for help. The kittens were just a few weeks old, and dangerously malnourished and dehydrated. We were lucky to have an experienced kitten foster who was able to bottle-feed these boys for months and save their lives. Ziggy was adopted into a really nice family who had recently lost their black cat and also have 2 dogs! He is so loved by his 13 year old sister. Pepperoni (fka Liam) - CAT! - Pepperoni and his brother Ziggy were found in horrible condition by a good Samaritan in Brooklyn who saw them throwing the two tiny kittens in the trash.. They were in bad shape but they were bottle fed by their amazing foster Mom and Pepperoni started growing by leaps and bounds. Took a little longer for him to find a home, maybe because he has a cloudy eye, but boy did he hit the jackpot. Here he is pictured with his sister (he's in the back) KP, who fast became his best friend in the world! His home is a kitty paradise with toys and cat beds everywhere and he is loved. Ranger - Pit/Hound Mix - Ranger was a 5 yo owner surrender to our rescue when his Dad lost his home and had to move somewhere he could not bring him. Ranger was an adventure for us! He had so much anxiety from this life change that he fell apart in boarding, and then upon arriving in a foster had bad anxiety. He started showing signs of distress and a trip to the vet discovered he had a large winter glove in his stomach!! He had surgery and was shown so much TLC by his foster family and eventually he found his way to his new Dad. He is still getting his bearings but his Dad is patient and is working with him and we continue to offer our support. Zeus - Labrador Retriever - Zeus is a 5 year old owner surrender to our rescue (originally we were told he was 8 but that turned out to be way off!) who came us after his owner passed away suddenly. Zeus was bounced around a lot in his life. He came to us thin and never vetted. He was neutered, treated for some infections and then the worst thing happened - Zeus became bloated one day at Houndstown in Farmingdale where we were boarding him. He became extremely lethargic and thanks to the staff at Houndstown noticing he wasn't well, we rushed him to the ER and his life was saved. Zeus had an adoption pending at that time which was postponed a couple of weeks but his new Dad waited for him while he recovered, and now he is his Dad's one and only boy, and even goes with him to work sometimes! He is working on dealing with anxiety and basic manners in the home, but this was a real love match! Sisters Jules & Kimmy (CATS!) were found by a good samaritan as tiny kitties in Brooklyn. We came to know of them through word of mouth as the woman who found them was not able to afford to give them the care they needed and wanted to adopt them out. So we had the girls spayed and vetted and found them great homes! Sweet Kimmy is now known as Muffin, went to a lovely family and has a Mom and two human siblings and bird siblings!! Jules is her Mom's first pet and she is very adored! !